The number of women in the military -- both active duty and veteran populations -- is growing rapidly. They face unusual challenges because of their military experiences and for many, multiple roles as breadwinner, parent, and spouse. Often their return to civilian life is difficult. An estimated 75,609 veterans are homeless, sheltered or unsheltered, on any given night. Women were 10,214 (7.5%) of the 136,334 homeless veterans who were sheltered sometime between October 1, 2008 and September 30, 2009 (U.S. Department of Housing and Urban Development and U.S. Department of Veterans Affairs). Female veterans have a greater risk of homelessness compared to their civilian counterparts. Risk of homelessness for recent veterans, particularly women who served in Iraq and/or Afghanistan, is increasing. The experience of trauma prior to enlistment coupled with trauma experienced while in uniform is a common denominator among homeless female veterans. Research suggests that 81-93% of female veterans have been exposed to some type of trauma, significantly higher rates than the civilian population (Zinzow et al., 2007). Traumatic experiences include childhood abuse and neglect, domestic violence, military sexual trauma, and combat-related stress. These experiences have a significant impact on mental and physical health, family relationships, and housing and job stability. 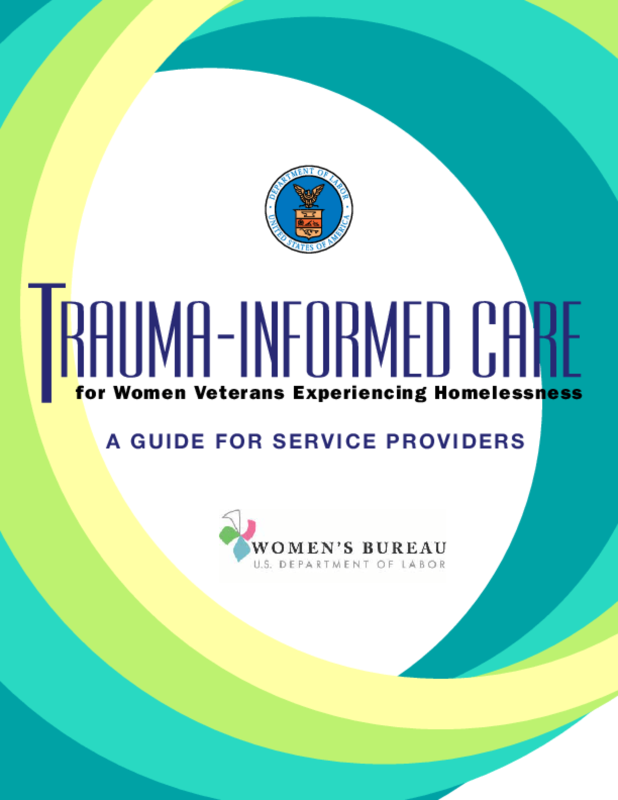 Trauma Informed Care for Women Veterans Experiencing Homelessness is designed to be used by community-based service agencies that work with homeless female veterans in a variety of settings (e.g., emergency shelters, domestic violence shelters, transitional and supportive housing programs, outpatient settings). Leaders within these organizations who are looking to improve their effectiveness in engaging the female veterans they serve can use this guide to begin the process of becoming trauma-informed. All material appearing in this report is in the public domain and may be reproduced or copied without permission from the U.S. Department of Labor Women?s Bureau. Citation of the source is appreciated. No fee may be charged for the distribution of this material.